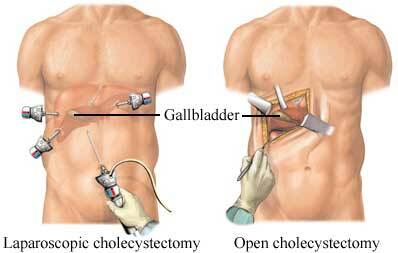 Cholecystectomy is the removal of the gallbladder. Open is one method for this surgery. It uses a large cut into the belly. A diseased or damaged gallbladder may need to be removed. There is another option that uses smaller cuts and may have a quicker recovery. The option called laparoscopic surgery is not always appropriate. An incision will be made in the upper right area of the belly. The gallbladder will be separated from the items around it. This includes the liver, bile tubes, and blood vessels. The bile tubes will be checked for stones. A dye may be used to highlight any stones. The tube may be opened to remove any stones. The rest of the belly will be carefully checked. This will be done to make sure you do not have any other problems. The cut will be closed with stitches or staples. The area will then be covered with a bandage. Anesthesia will prevent pain during surgery. The cut can be uncomfortable for a few days. Medicine can help to manage the discomfort. You may have a tube that will go from your nose down into your stomach. The tube will help to drain fluids and stomach acid. You will not be able to eat or drink until this is removed. You will continue to receive fluids and nutrition through an IV. When you are able you will be started on a liquid diet. Your diet will be slowly moved from liquid to soft foods. Then to your regular diet. Recovery takes about 4-6 weeks. The gallbladder plays a role in breaking down fatty food. The liver will begin to take over the job but you may need to make some changes in the beginning. You will be given a food plan. It will include slowly getting back to your regular diet. Some can have discomfort after eating fatty foods. This is most true in the first month after surgery. Slowly add different foods to your diet. Focus on smaller meals. This may prevent major discomfort. Cholecystectomy. EBSCO DynaMed Plus website. Available at: http://www.dynamed.com/topics/dmp~AN~T900759/Cholecystectomy. Updated August 17, 2018. Accessed September 3, 2018.